The Novotel Ambassador Seoul Dongdaemun Hotel is an upscale Accor Hotel located in Dongdaemun, the place where shopping, entertainment, culture, and business coexist. Based on the motif of the eaves of Heunginjimun Gate, there are a total of 523 guest rooms that boast a modern and comfortable interior, 331 are hotel guest rooms and 192 are residences that are hotel rooms equipped with kitchenettes. Also, there are an all-day dining restaurant, a roof-top bar, infinity pool, fitness center, sauna, kids room and other exclusive facilities for guests to escape city life and experience unique relaxation. The hotel also has modern convention facilities that can accommodate a maximum of 300 people in the Grand Ballroom and small all-purpose meeting rooms, perfect for the successful hosting of various meetings, gatherings and weddings. The hotel is located close to Dongdaemun History & Culture Park Station, an intersection of subway lines 2, 4 and 5, and is also close to Dongdaemun Design Plaza, and Dongdaemun Market. Also nearby are City Hall, Gwanghwamun, Myeongdong, Namsan and other major tourist attractions offering the optimal location for business travelers and tourists alike. 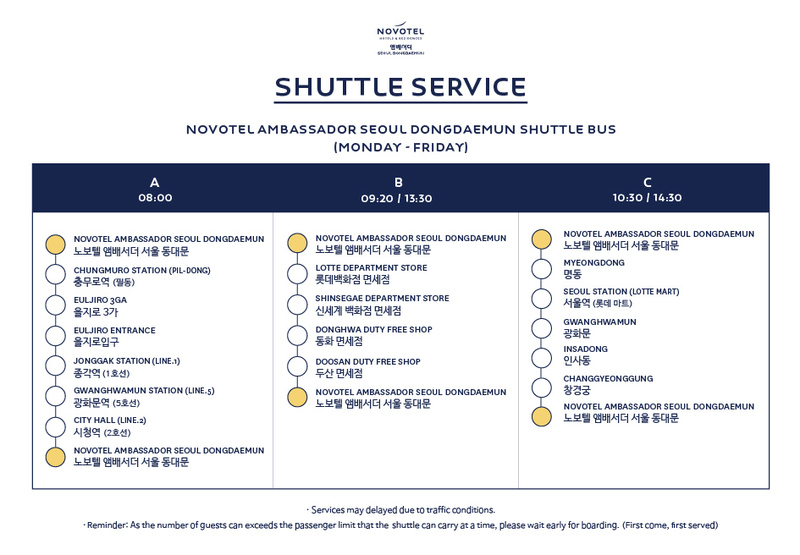 Also, the hotel is situated near limousine buses stops for buses traveling to and from Incheon Airport and Kimpo Airport, and there are subway, city bus and other public transportation facilities located nearby making it easy to get to wherever you would like to go in Seoul. We work hard to offer business travelers and tourists the most comfortable experience. Parking space is limited, please use public transportation. Take buses 100, 105, 152, 202, 261, 407, 2014, or N30 and get off at the National Medical Center stop at Euljiro 6 ga.